Fix: Altered the grid control height to prevent overflow. Fix: Set Technicians dropdown query to order alphabetically. Fix: Altered report run process to search Report object for all objects requiring a data source, and binding them manually prior to display. Fix: Attempting to open the Sales Receipts tab without a customer selected will launch an alert requesting the user allocate a customer before creating sales receipts. Fix: Error was caused by an invalid value being passed into the form - amended the form query to select and coalesce this value to 0 rather than pass it in. Fix: Added a button to create a new Sales Receipt, in the Sales Receipts window. Performing a successful Vehicle Registration lookup in VGM will now log the lookup details to the database, aiding in support ticket resolution and usage tracking. 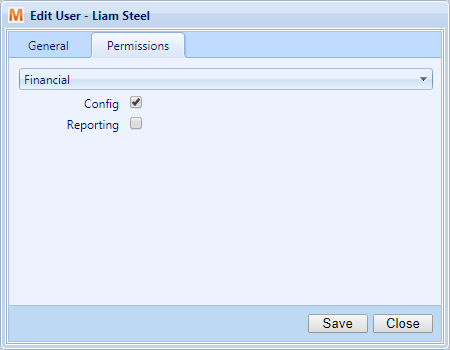 You can now restrict access to Financial Reports for non-admin users in VGM. Navigate to Config, Users and double-click on a user, click on the “permissions” tab and select Financial from the dropdown, and toggle the “Reporting” checkbox on or off. 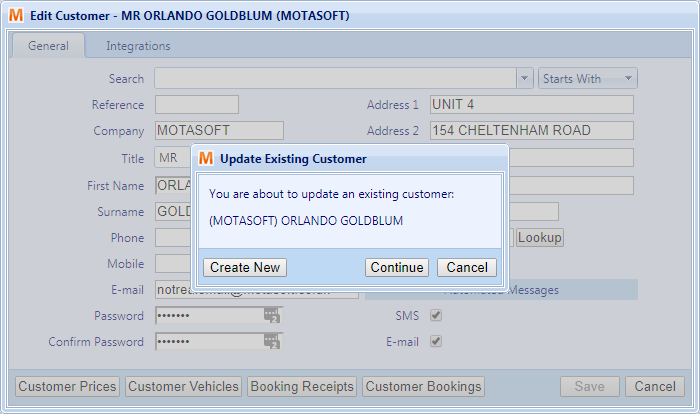 Altering and saving the data of an existing customer will now trigger an alert asking whether you want to update this customer or save the details as a new customer entry. When you move a booking which has an associated jobsheet to a different time or date, VGM will now offer you the option of updating the associated Jobsheet as well. When you create a Sales Invoice from a jobsheet that contains Parts line items, deleting or altering the quantity of that item will now be reflected on the Jobsheet as well. Please note: In order to prevent the malicious deletion of Parts items (which would now leave no paper trail as a result of this feature), only Admin level users will now be able to delete or alter the quantity of Sales Invoice Part items created from a Jobsheet. The Tyres screen now has an “Attributes” search option. This option will allow you to search your Local and Grouptyre available stock by Width, Profile, Rim Size and Speed Rating directly, rather than use a stock code. You can now filter your local Parts and Tyres stock grids by their stock quantity. Toggle this option on or off using the checkbox located in the top-right of any stock grid within VGM. We have replaced the existing single “Nominal Code” field on Parts and Tyres with independent “Purchases” and “Sales” nominal code fields, allowing you to specify different nominal codes for sales and purchase documents. You can also specify to use the Default for that part, which will then look for a valid nominal code on the associated product group, or failing that use the global default for your branch. Please note: These nominal codes will be applied automatically when adding parts to financial documents and jobsheets. You can now right-click on sales documents (Sales Invoices, Quotations, Credit Notes) in the “Sales Invoices” tab, and create a new SMS, Email or Printed message for that customer. You can now select “Dr” from the Titles dropdown when Adding or Editing a customer. 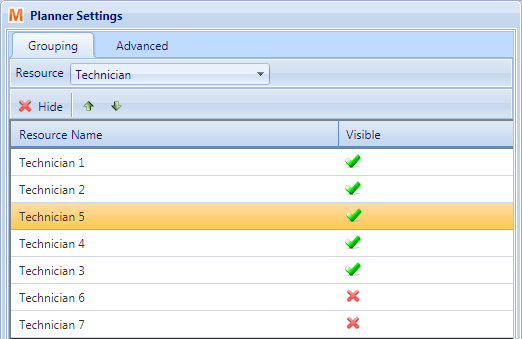 You can now associate planner appointments with a resource (Technicians, Bays or Slot Types). These appointments can now also be dragged between different resources of the same type. You can now configure the resources visible in the planner on a per-user basis, and order them however you wish. These settings are saved to your user profile, so will persist when logging out and back in again. You can now re-calculate the delivery dates and times for all existing reminder messages when altering the delivery offset for slot type reminders. Tick the checkbox next to the save button to update these reminders upon saving. 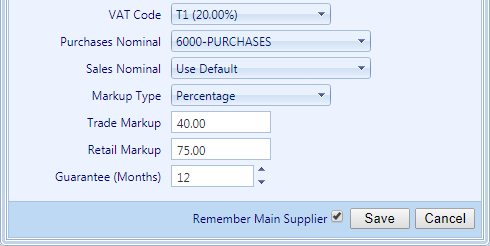 The purchase orders grid will now show a “Fully Fulfilled” column, indicating whether that order has been completely fulfilled by sales invoices or not. You can also filter by this column using the filter dropdowns next to the search. Users can now print purchase orders. You can do this using the “Print” icon in the Purchase Orders Screen toolbar, or using the “Print Purchase Order” button in the bottom-left of the “Edit Purchase Order” window.